On the bright morning of May 3rd, e 2014 thJeju Junior Journalists went to Samseonghyeol park in Jeju. They interviewed visitors of Samseonghyeol to learn about what people think about Jeju. Samseonghyeol has three big holes where three God-men, progenitor of Ko, Yang, and Bu had spouted and it became the birthplace of Jeju Island's native people. The three God-men god married with three princesses of Byung-Lang which brought seeds of five grains, calves, and colts. It's been said that that top hole is where Ko Eul-na came from, the left hole is where Yang Eul-na came from, and the right hole is where Bu Eul-na sprouted from. 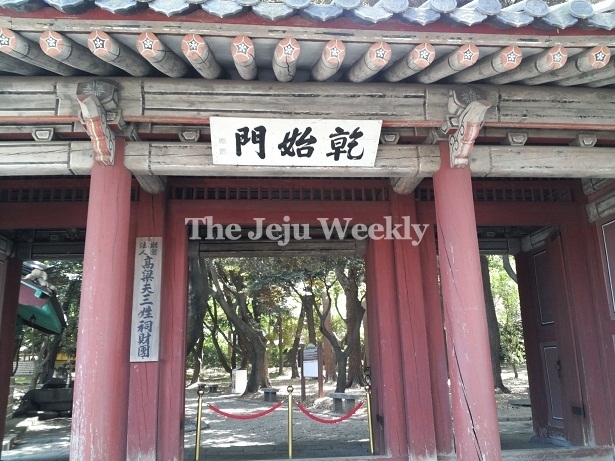 Samsunghyul became a famous attraction of Jeju which lots of tourists visit every year. An interesting fact about this place is that only men who have last names of Ko, Yang, and Bu can work in Samsunghyul. When the JDC Junior Journalists interviewed people about how to make Jeju Island a more famous and international place, there were many different answers. A 42 years old woman named Jung Jin-hyun suggested that there should be more attractions to tour because she is always repeating the same things every time they come to Jeju. A 25 years old man named Lee Eun-bin said the prices were more expensive than he thought it should be, so government should stabilize prices. But most of the people thought that the best thing to do would be topromote Jeju so that many people around the world will know about it.